Pakistan’s fired chief justice was reinstated in a flag-raising ceremony at his house Sunday after the government bowed to protesters’ demands following days of massive demonstrations. The flag-raising was ceremonial. 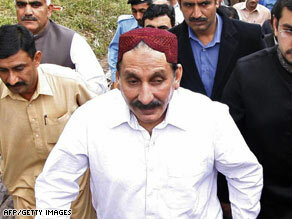 Justice Iftikhar Muhammad Chaudhry will not renew his oath of office because his firing by former President Pervez Musharraf was deemed illegal. About 100 people gathered outside Chaudhry’s residence, some dancing, some beating drums in a boisterous celebration. A growing protest movement had demanded that Chaudhry and other judges that Musharraf fired be re-seated. Buckling under pressure, the government of current President Asif Ali Zardari agreed. Along with Chaudhry, most of the sixty others who had been fired have also returned to their posts. Two unresolved matters will immediately test Chaudhry on his return to office: The Supreme Court last month barred Nawaz Sharif from holding public office, citing a criminal record that dates to the late 1990s. The court also stripped Sharif’s brother, Shahbaz, of his post as chief minister of Punjab. Sharif supporters have accused the court of making the decisions at the behest of Zardari. The government has said it will seek a review. Political observers will also watch to see what Chaudhry will do about a controversial amnesty that Musharraf granted Zardari. Some experts have surmised that one reason Zardari delayed acting on Chaudhry’s return is because the Supreme Court wanted to look into the amnesty. Both Zardari and his late wife, one-time Prime Minister Benazir Bhutto, had been granted amnesty by Musharraf so they could return from exile in 2007 and participate in elections. The couple faced numerous charges of corruption. Bhutto was assassinated during a campaign rally. Her husband became head of her party and the new president of Pakistan. Zardari promised to reinstate the judges within 30 days of taking office. The deadline came and went.